DYNAMIC SEARCH ADS · 8-MINUTE READ · By Tina Arnoldi on August 28 2017. Do you enjoy doing keyword research? Probably not. It is one of the more tedious steps with Google AdWords campaigns. Depending on how many people are involved, it can be a lengthy process if you have to get pre-approval from other departments and research the volume and competitiveness of keywords. Once that initial work is completed, you then monitor search terms on an ongoing basis because there will always be some strange word you did not consider for your original campaign that needs to be added as a negative keyword. Where are Dynamic Search Ads Used? There are two cases where I find DSA campaigns especially helpful. The most common is for sites that have a large inventory, such as a retail store, or where the pages constantly change. Advertisers can reach customers without thousands of keywords needed for each corresponding product line or have to create a new ad every time something new is launched. I also use DSAs with newer websites as market research or with niche sites that depend on long tail keywords. This lets Google do some of the keyword research to potentially use later in a Search Campaign. By running DSAs for a while, you learn what people search that leads them to your website so the consumer is very much in control. You speak in their terms because their search query is shown in the ad – similar to Dynamic Keyword Insertion. Using DSA as a discovery process allows me to build brand awareness for a client while developing traditional Search Campaigns and landing pages. The results from even a short-term DSA campaign provides an opportunity to mine for keywords based on actual search queries that I may want to use in keyword campaigns later on. To create your first Dynamic Search Campaigns, start with categories based on the groupings of a website or with specific sections of the site, indicated by the URL. The goal is to capture searches that may be missed in the campaigns with keywords or when used for discovery. If you already have campaigns that use keywords, there is no conflict because the more specific target will be the favored one when multiple website pages are eligible in an AdWords auction. A potential issue with specific pages is that they can be very limited which is why a broad approach helps capture everything else on a website that’s not currently covered in existing ads. Allowing Google to match a search term to a web page is helpful too to know how Google sees a site. Although there is not a keywords list, there are still optimization steps to take with DSAs. 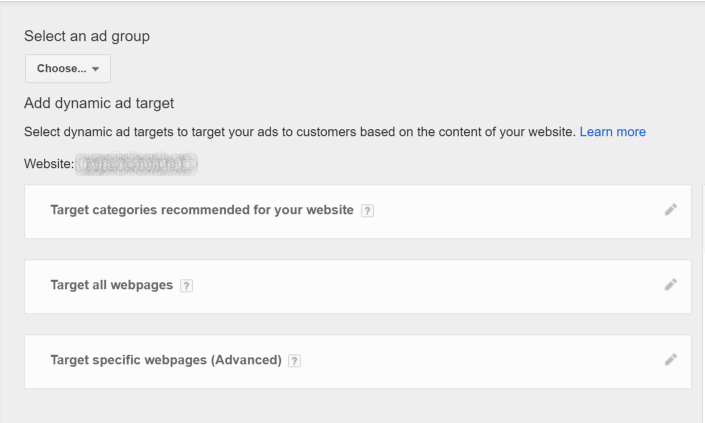 After you collect data, you can separate high-value dynamic ad targets based on insights in the categories report. Once that is done, you create different ad groups for each target to get more specific with the descriptive text in an ad. In the below example, splitting the category on the second line is a good strategy since the CTR and conversions are quite a bit higher than the category on the first line. The CPC is also less. Unless categories are obvious (they were not with this client), start broad and divide into categories later. The subcategories that perform well can be broken into their own ad groups with different bids. From the beginning though, exclude traffic you do not want to pay for since some visitors will not have value, such as those looking for a job. To do this, exclude non transactional parts of a website such as blogs, career pages, or out of stock items. Just as you would do with a keyword campaign, check for negative keywords in the search terms report while the campaign is running. Although some terms may be relevant to the business as a whole, they may not provide value when it comes to conversions. Remember that DSAs fills in gaps – even gaps you do not want filled. Anytime you pause a keyword from other campaigns, add those as negative keywords to the DSAs campaign so those terms will not trigger any of your campaigns. Advertisers do have more control with traditional Search Campaigns since they are keyword based which is viewed as a disadvantage with DSA Campaigns. There is also some risk in showing for less-relevant traffic, but can managed by monitoring DSA campaigns for search queries to add as negative keywords (in addition to kicking off campaigns with a negative keyword list) and excluding the non-monetizing sections of a website. Although you cannot determine estimated costs in advance, you can start a campaign with the maximize clicks bidding strategy. This will set bids to get as many clicks as possible within the overall budget. I personally do not view a DSA as giving up control — it’s about taking advantage of Google’s machine learning. You can run DSAs in conjunction with your regular search ads as a way to capture those longer tail keywords. When your website displays in response to a longer tail query, the CTR will be higher since the headline will be very close to that exact query. It also gets those longer tail keywords searchers use that have not yet been identified while displaying dynamic ad content. In the below example, you see comparable conversions for this short period of time with a higher CTR and lower CPC for the DSAs. This advertiser is being rewarded for their relevance. With optimization, advertisers can control their ad display by utilizing targeting options, specifying pages and using negative keywords like they would with regular search campaigns. I Have Started Using DSAs: What’s Next? Over time, you can incorporate advanced strategies by combining DSA with other tactics, such as automated bidding to drive conversions or clicks or layering RLSA (Remarketing Lists for Search Ads) on DSA campaigns for pre-qualified users. Combining DSA with RLSA allows businesses to get in front of the target audience as they search for content that may not be covered by keywords. Learn more about Dynamic Search Ads with this short clip from Google. With a large website, or a smaller one where you want to do some research and discovery, a small DSA campaign that is watched very closely can bring great results.